WeGo Demonstrates its commitment to local Nashville Vendors! WeGo Public Transit recently hosted a procurement open house for vendors, primes and subcontractors…with a focus on attracting minority and women owned businesses to apply for it’s procurement program. Our work included organizing the event with the procurement department, communicating, amplifying and managing several aspects in support of the internal team. One of which involved an intentional use of a minority-owned catering company. In early stages, the organization was interested in managing costs, which of course is important. dGC recommended that tapping vendors who fit their target audience (for this event) would make a strong statement about their commitment to placing its resources in the community. As a result we worked with Chef Batts, bringing him to the table (no pun intended) to provide catering services. As days led up to the event, the leadership team let dGC know that they had a surprise for Chef Batts….and it was to present him, on-site, with a contract for future catring of WeGo meetings and events, up to $1k. On the day of the event, WeGo made an even bigger commitment, sharing that they valued the advice and service we provide and went big! 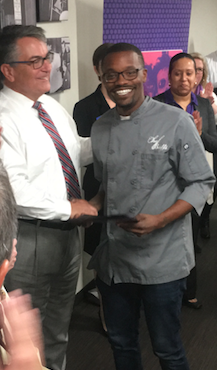 WeGo CEO, Steve Bland, surprised Chef Batts with a $3,000 purchase order for future catering services – demonstrating its commitment to local vendors! duGard Communications coordinated the event and captured the amazing moment. 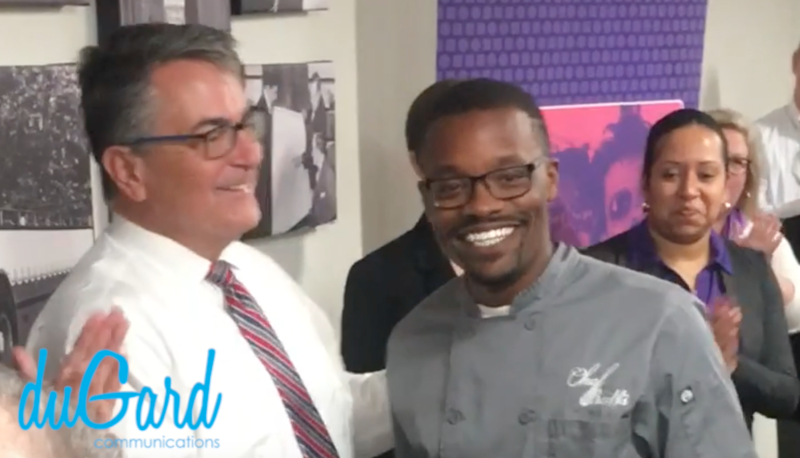 Chef Batts has been featured on Nashville’s own Talk of the Town broadcast on Channel 5 news and made an appearance on USA Network’s Chrisley Knows Best. He has also been featured in carious magazine such as Stay On The Go, Edible Nashville, Nashville Scene, NATIVE, and more. He won the People’s Choice Award at the 2016 Foodbank Throwdown hosted in Nashville, TN. Currently Chef Batts is the CEO of Chef Batts, LLC where he provides personal/private chef, weekly meal prep, cookie, and catering services. duGard Communications is proud to call WeGo Public Transit a client! duGard Communications is a small business that has served the Nashville community for years.